You may not recognize the name Sara Gruen, but you probably recognize Water for Elephants – the beautiful novel, the romantic film. 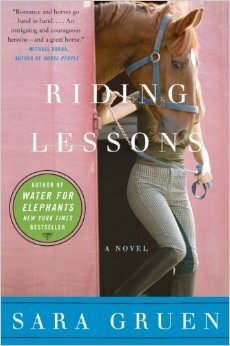 Riding Lessons was her first novel and I picked it up in a discount bin not long ago only because I’m always curious about first novels. The story centers around the emotional breakdown of Annemarie Zimmer. We step into her world just as her father is diagnosed with ALS, her husband leaves her for another woman, and her fifteen-year-old daughter hates her guts. It’s not pleasant, but life requires her attention, so Annemarie packs up and heads home to New Hampshire, to the horse stable where she grew up and trained to be an Olympic rider, to help care for her dying father and figure out what comes next. As one could imagine, her world is in disrepair. She never became that Olympic rider because an accident prevented her from competing. Her beloved horse, Harry, died and it broke her parents’ hearts to see her quit the equestrian world altogether. Coming back to New Hampshire, Annemarie thought she could slip ever so easily back into that lifestyle without making waves. Unfortunately, her efforts to manage the farm and care for her father, and repair the relationship with her daughter, are made more challenging when a crippled horse – who looks just like Harry – trots into her life. I’ll say now that I didn’t enjoy Riding Lessons as much as I enjoyed Water for Elephants, but only because it didn’t have the same magic and whimsy (who doesn’t love a story about running away with the circus?). Still, Gruen’s writing was pleasant and fluid. It was a quick read and a redeeming story that deals with varying degrees of loss and the long road one must travel to find a new normal.